Powerful response tracking for email follow up. Use Boomerang for Gmail’s powerful response tracking feature to remind you to follow up on emails after no response. One of my faves! Try Boomerang for Gmail. 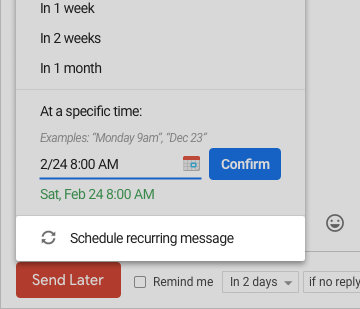 You can schedule emails to send at any time and track responses to follow up. One of Boomerang’s most powerful features is tracking responses. 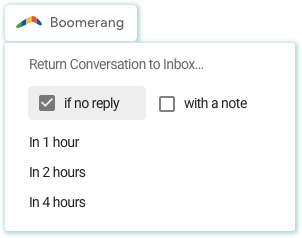 When writing an email, you can set Boomerang to give you a reminder if you don’t get a reply after a certain amount of days. If the message comes back to your inbox without a response, you can then react by sending another email to follow up. You can now schedule your follow-up message as you're writing the original email. If the person replies to your original email, Boomerang will detect the response, and will not send the second email. If they don’t reply, Boomerang will send the follow-up message automatically. You’ll never have to let another important email fall through the cracks.